Having a good looking profile is the foundation for success on social media. It is your facade towards the public, and if it looks unprofessional, boring and unappealing, it will have devastating effects on the results you have the potential of reaching. If you have a physical location that isn’t set up properly and doesn’t look inviting, do you think a lot of people will visit it? As a marketer, you are probably spending quite some time on social media, but how much time, and how many times have you improved your social media profiles to make them look more appealing? Often times, people just want to start directly by putting their methods to generate social media results into action. The only issue is that improving their profile is seldom part of that. When you do something, you cannot start on the wrong end. If you’re building a house, you cannot start building the walls before you’ve laid the foundation, right? Well, the same goes for social media. In this article, we’re looking at ways you can improve your social media profiles to generate better results. The images on your profile are usually what people will see, so it’s important that you put great emphasis on them. Something that makes you look like an amateur is if the images you’ve uploaded are in the wrong format. It will look unprofessional and be a big turn-off. When uploading your images, make sure you check the image sized before. Here’s a list of the different sizes by Hootsuite. Almost all social media platforms allow you to add a link in your profile’s bio. That link is extremely valuable because it allows people who are curious about your brand that has just come across it to learn more. But when your link is broken, it’s hurting you more than it is helping you. If you have broken links on your website, Google will punish your ranking because it hurts the user experience. And it’s true! How much do you enjoy seeing an Error 404 when clicking a link? Not so much, because I am pretty sure that’s not the address or page you wanted to go to. If you have a broken link in your profile, it will seem like you aren’t using the page anymore, because who adds a broken link on purpose to their profile? In addition to that, you will miss out on valuable traffic that might have converted into customers. Having a consistent theme in your posts is extremely powerful and effective, but in this matter, I am especially focusing on your profile images and header images. When you have accounts on several social platforms, you want to make it as easy as possible for people to find you across the web. Therefore, having the same profile images and header images will allow people to instantly recognize your account when they come across it – even if it is their first encountering with your brand on that particular platform. Having the same profile photos across your accounts will build your reputation, and increase logo awareness. When people are constantly fed with your logo from all the accounts you are active on, the bigger chances that they’ll think of your brand when they need your service or product. As a brand, you only want to use your logos in order to look more professional and to increase recognition and awareness. Having the same account name on all your social media platforms is extremely valuable. When you have the same account name, you make it a lot easier for people to find you, and when your account name is the same as your brand name, that’s when you’ve made it as simple as it can be. Think about it: if you want to find Coca-Cola on Instagram, what do you search? Coca-Cola of course! But what if their Instagram handle would be “Coke”? Now, you would probably be able to find them due to their sheer size, but it would most likely take more time. But as a smaller brand, it is crucial that you use the same username across platforms – that is your brand name. Now, you would probably be able to find them anyway due to their sheer size, but it would most likely take more time. As a smaller brand, though, it is crucial that you use the same username across platforms – that is your brand name. Also, if someone is following you on one platform but want to check you up on another, what do you think they’ll search for when looking for your account? Obviously, the same username as you have on the platform they follow you on – because they expect them to be the same. But if they aren’t, you’re making it more difficult for your customers to find you, and you make their process of ultimately being converted into customers more complicated. When you have set your usernames to your brand name, you will also notice that more people are mentioning you, because they can actually find you. When people search for something, your social media profile may come up as a search result. Therefore, you want to optimize the words you use in your profile in order to increase the number of times you show up on Google searches, and also the rank you have when people search for certain things related to your industry. To help you rank better, adding a few keywords related to your industry is extremely helpful. When doing this, it’s important that you avoid keyword stuffing which is basically just repeating the same keywords over and over in a sentence. This will have the opposite effect on your ranking. Instead, you want to try and incorporate your keywords in a way that makes the reader experience good. You never want to add keywords in a way that makes the piece of text unreadable. In the first hand, you write for humans, and in second hand, you write for search engines. The first step you should take when setting up your account is to fill out all sections and parts of your profile, but surprisingly, not a lot of people do that. Of course, what these parts mean differs from platform to platform, but the most basic is your bio – a short piece of text describing your brand, website, contact information, and profile image. 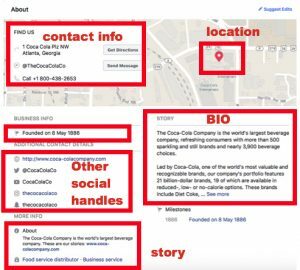 If you go to Coca-Cola’s Facebook profile, you can see that they’ve included everything. They have a location, contact information, a well-written bio, their other social media profiles (which all have the same username), an about section, and information on when the company was founded. When you click edit profile on the respective platforms, you will have a clear template that shows you what you should fill out. And most of the time, you shouldn’t leave any fields blank. The bio you write is extremely important, because most people read it, making it the deciding factor whether people want to start following you, visit your profile, scroll through your feed, or run quickly the other way. It’s important that you write a fun and engaging copy that gets people excited about your brand. Of course, doing this isn’t an easy task, but experiment and don’t feel like you are obligated to have the same bio forever. You can change it if you feel like it isn’t converting well! Your bio should reflect your brand’s personality, so there’s no “one format” that you should follow. Some brands are serious and professional – and that’s fine if that is their brand personality. Other’s are humoristic and edgy, and that is also fine if that is the brand’s personality! 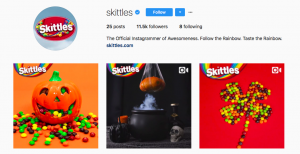 Skittles’s Instagram bio clearly presents the brand’s personality, and this will allow their target audience to find them appealing at the first encountering with their page. There’s nothing that says that you need to have the same link for all eternity in your profile bio. And let me guess, it is probably a link to the homepage of your website. Now, all social platforms are different, and for most of them, you can share links to your posts as well which minimized the issue that I am bringing up, but for platforms like Instagram, where the only place you can share a link (except for Stories) is in your profile. Just because you can only have one link on Instagram doesn’t mean that you can’t change it how many times you want. This means that you can quickly change the link in your bio if you have a special sale or promotion going on, making the link more relevant to your followers. Rolex is a brand that has realized the power of this. 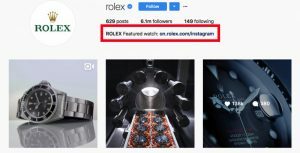 Every week, they feature a particular watch model, and appropriately, they change the link in their bio that directs their followers to a page about that model. There’s a reason to why you create landing pages when you create ads. If you share posts about your new summer collection, you don’t want to lead them to your website’s front page and say “good luck, hope you find what you’re looking for”. That’s like leaving a child far from home and expect them to find the way home. Your visitor will be confused, wonder where the product they saw on your post is to be found, and then when they don’t find it, they’ll bounce off your website. You’ll never get a second chance to make a great first impression, and that’s why setting up your social media profiles and tuning them to perfection is vital, because the first encounter people will have with you on social media, will most of the time be your profile. By working to improve your profile, you can present yourself as more interesting and appealing, and get people so curious about you that they decide to start following you or even visit your website. If your social profiles look bad and not taken care of, it will affect how people view you as a brand. There is no second chance. The first impression is what matters, and you can’t afford to ruin it with a bad looking profile.